Among the wide range of specialized telecom industry organizations that have formed, one of the hidden gems is an organization called the Global Settlement Carriers Group. I’m proud to be able to associate with this organization, and in this post I would like to share some highlights from the 22nd Global Settlement Carriers Group Forum just held in Paris. The Global Settlement Carriers Group was formed in 2003 to help carriers implement simplified solutions for intercarrier billing and settlement and to enable business process development for the benefit of telecom carriers globally. Twice a year, the group holds an international conference that in the past has drawn as many as 80 attendees from over 50 global carriers companies around the world. The event provides an invaluable opportunity to share ideas and discuss issues, and today’s telecom wholesale environment has no shortage of hot topics. Among some of the biggest discussed were price and margin pressures, complex commercial relationships, increasing traffic volumes, regulatory requirements, Net neutrality, and fraud and revenue assurance issues. I had the privilege of exploring these issues as both a presenter as well as a delegate. My presentation was “Building Blocks of Wholesale Assurance.” In it, I discussed how revenue leakage issues are affecting the wholesale environment, how increasing wholesale environment complexity is having an impact, and how the most important elements of wholesale revenue assurance should be defined. 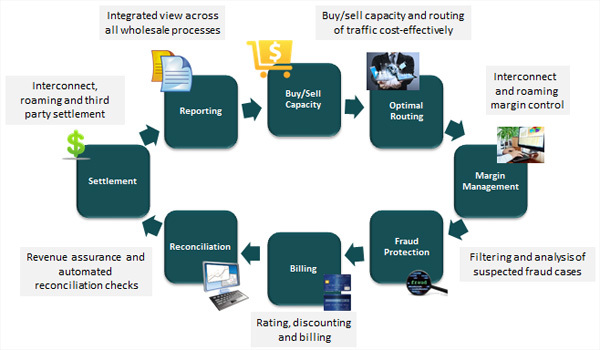 An overview of the wholesale assurance process that I discussed in my presentation. I also took part in a number of other idea exchanges, two of which were particularly noteworthy. First, I caught an update on the work of I3 Forum, a group established to help carriers understand and ease the transition to an all-IP world. I3 Forum has a team that focuses on all aspects of wholesale fraud, shares information and defines best practices to prevent fraud. One of its newest learnings is that the disputing and withholding of payments can be justified in certain conditions to combat fraudsters. These conditions include that a dispute only be raised for the fraudulent portion of traffic, that the fraud act be clearly substantiated, that specific time frames be set, and that complete information be shared in order to substantiate fraud instances. A second insight is that, as referenced in my presentation above, fraud and revenue assurance continue to be important revenue management issues. Call hijacking, false-answer fraud, private-branch-exchange hacking, and international revenue-share fraud all continue to threaten carrier profits. In respect to pure revenue assurance issues, arbitrage and traffic brokering are significant issues. Also, there was much discussion at the conference about the need for risk mitigation as far as credit control and referenceability, which has resulted from an increasing number of relatively small international traffic carriers. The conference is one industry event in particular that manages to be entirely informal while at the same time highly focused and informative. It was a rewarding experience to take part in advancing the way telecom billing is being optimized. And, of course, any opportunity to meet like-minded telecom professionals is made all the more pleasant when it can be combined with being able to absorb oneself into the unique atmosphere of the beautiful city of Paris.